The Dome of peace is the name I have chosen for my artwork. I chose this name since I drew a Dome and under it the word Peace in Arabic and English.The Idea of calling it The Dome of peace came to me from The Shrine of Dome of the rock. 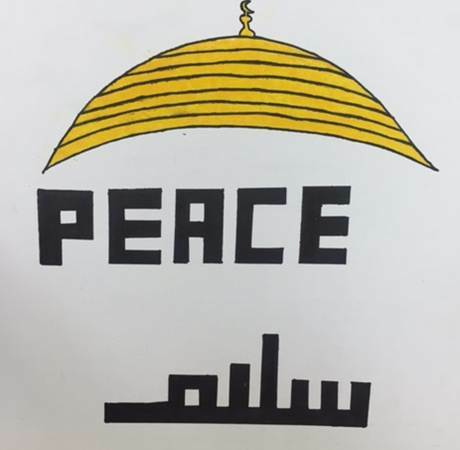 My idea is basically to write سلام (salaam) in the Kufic calligraphy and above it the word peace. But peace will be written in a way that is similar to the style of the Kufic calligraphy. I got influenced to write peace in a similar way to Kufic Calligraphy by the artist Julien Breton. Since the Breton’s style is writing English letters in the form of Arabic calligraphy. So I wrote سلام in a Kufic calligraphy and peace in a similar shape. I specifically chose the word سلام and peace because they have the same meaning and at the same time they both represent Islam. The Dome above the two words Symbolizes Islam. The gold color for the dome was chosen for 2 reasons. | 1st reason is that I wanted to give my artwork something related to the Islamic history and I found the dome of the rock a good choice. | The 2nd reason is that in Islam the gold color it paradise and by that I meant to show that the path to paradise is Islam. As Edgar Degas said “Art is not what you see, but what you make others see”. In conclusion, I have tried to translate my opinions and thoughts of Islam into art with my humble abilities. And I hope that I made people see what I see.